The beverage industry is one of the most exciting spaces for entrepreneurs to venture into because of its fast pace and vast opportunity. According to Research and Markets, the global beverage industry is expected to reach $1.9 trillion by 2021. Huge companies like Coca-Cola and Starbucks compete for shelf space and mindshare along with start-ups amongst rapidly changing trends and customer preferences. The game is fierce, but it can also be fun. Small businesses have new tactics and tools like online sales and social media to compete with more established brands, but the number one way to give your beverage a fighting chance in the competitive world of beverage retail is to make the competition irrelevant by creating and leading in your category. A category is a bucket that your product gets put into in the mind of the customer, in distributors’ catalogs, and on retailers’ shelves. How you choose and define your category and the need you fill within it determines, more than anything else, your chances of success in the market. The last thing you want to do is to approach a wholesaler with another hard seltzer when they are already carrying ten hard seltzers that aren’t performing. You need to convince distributors and retailers that your product doesn’t replicate what they already have because it brings something new and desirable to the consumer. No matter how hot a category is, there is only shelf space for the top three or four offerings within a given category, and It’s difficult for a small company to enter a space where there are established brands with more money and resources. It’s also challenging to steal consumers away from brands they’ve been drinking to get them to try a new product within the same category. When you create a new category, you don’t compete for the same shelf space as incumbents. Your beverage is seen as the leader in a category that didn’t exist before your product came along. It’s that positioning that will win over both retailers and consumers. When examining categories to enter, there are some important factors to consider. Each category has core characteristics that are required or expected for a product to be deemed part of that group. Make sure you understand those characteristics and how they play into your target market’s purchasing decisions. For instance, to be classified as a flavored malt beverage, there are production and formulation requirements that the product will have to follow. You should also note the possible substitutes and complements for a beverage type. What might someone purchase instead, if your product is not available or within their price range? What other purchases signal a possible interest in your beverage? It’s also important to know who the other players are in the category and how long they have been in business. It’s more difficult to break into a mature market with established brands than a newer category that is still forming. A company that wants to bring a new hard cider to the market, for example, will have a more difficult time differentiating right now than one breaking into the still immature, and fast growing, hard seltzer market. When entering a market where there are products from large beverage conglomerates, take a look at how those products’ prices stack up against production costs. If a company is using a product in a category as a loss leader, entering and competing on price could kill a startup. Objectively looking at these factors will ensure that you’re making the strategic decisions to set your idea up for success in the market. It’s in everyone’s best interest to create a product that will sell, and while we can’t see the future, we do know what conditions are ideal for new products to grow and thrive. An exercise to find new opportunities and ideas is to visit your local retailer and browse the shel ves while asking yourself “what is missing?”. We created Mike’s Hard Lemonade when we saw that there were flavored malt beverages and there were lemon brews, but there was space in between for new type of drink that didn’t yet exist - a hard lemonade. We created that category and positioned ourselves as a leader instead of joining an existing group of products and competing directly on price or placement. Even in categories that seem saturated, there is usually room for innovation. Infused vodkas have extended the vodka market, and now infusion is starting to hit the brown spirits market. Look at changes that are happening in different markets and different industries and imagine ways to bring those ideas into a new product. Look at what is going on across the world. Trends travel, and there may be something from another geography that hasn’t yet made its way to North America. You’ll know you’re in a position to win when you can approach a wholesaler or retailer with something they don’t currently carry or didn’t even know existed. If you can help the market see what they’re missing and how your product will enhance their life, shelf space and sales will appear. 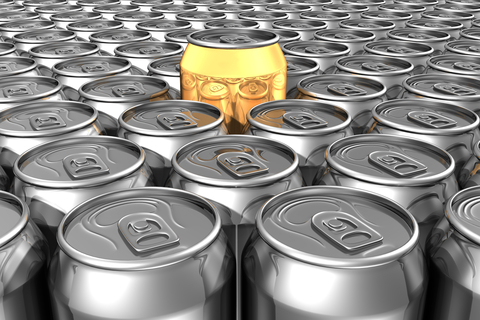 Change and innovation are the lifeblood of the beverage industry. Nobody can afford to stand still. The most successful beverage entrepreneurs practice thinking differently, spotting opportunities, and moving everyone in the industry towards their vision. Wholesalers and retailers are looking for innovators who are prepared to elevate the industry with the next great product. With some research, a little creativity, and a lot of tenacity, that product could be yours! Jason Kane is the owner of Liquid Opportunities, where he uses his more than 30 years in the beverage industry to help established brands and entrepreneurs create, develop, launch, and build successful beverages. Jason’s passion for the industry was ignited at a young age when he spent his summers working at E. & J. Gallo Winery and moved over the years from the mail room to sales and marketing. He later went on to work with Seagram’s and Miller Brewing Company, before serving as president at Mark Anthony Brands, where he helped create Mike’s Hard Lemonade. Jason went on to form his own beverage company and created and sold several beverage brands before launching his consulting practice.